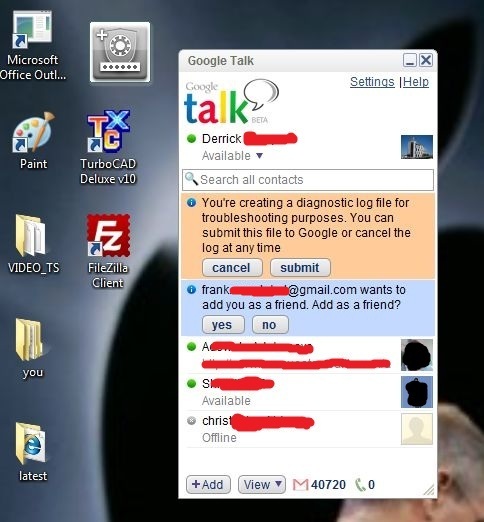 Google Talk is a chat app or instant messaging app that allows you to chat with your friends and contacts on your computer. If you know how to use Skype Chat or Yahoo Chat then it should be easy for you to figure out how to use GTalk or GChat, the other names for this app. 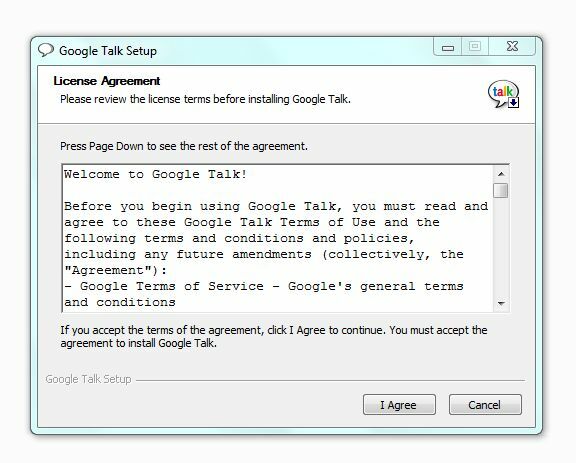 Installing Google Talk on my computer was swift and easy. 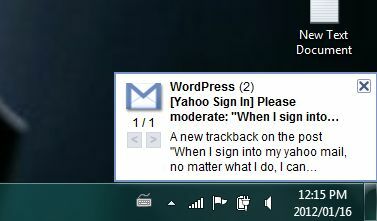 Within a few minutes I was already chatting on my PC and receiving mail notifications. What is the use of this Google app and how is it different from Gmail Chat? This app allows you to chat and read mail from your computer. You do not need to open your web browser to log into your Gmail account. All you need is to be connected to the internet to receive mail right from your PC. 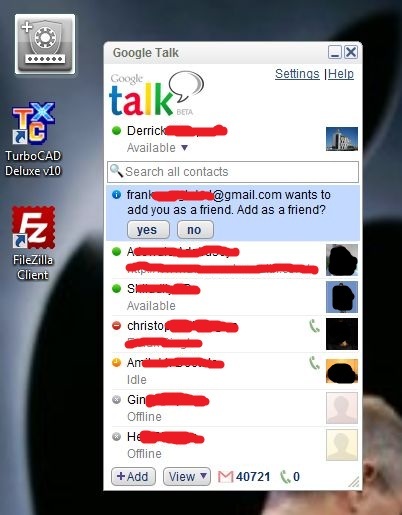 The GTalk app is available for most popular operating systems such as Windows 7, Vista, XP and Mac OS X10.5.It is also available for android mobile phones as well as some types of smartphones such as Nokia N900. This app is developed by Google Inc and offered free to users with Gmail accounts.GChat is a VOIP application that not only works with Google but with many other third-party apps. 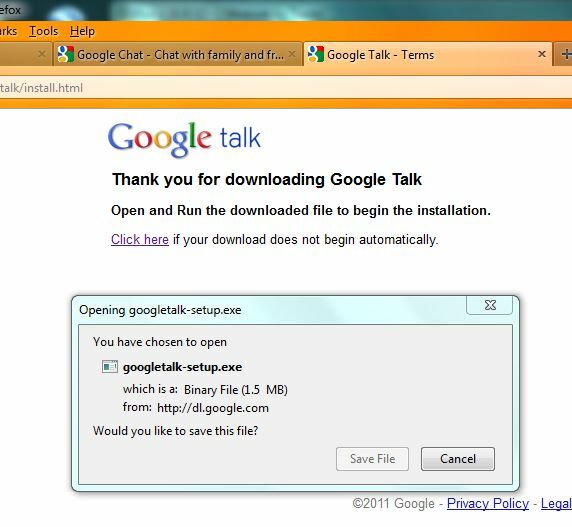 When you are on the download page, click the blue button on the right hand side [Download Google Talk].This should open the exe file [google-setup.exe] about 1.5MB in size, so it should download faster and instantly. When you have downloaded the file, browse to its location on your PC.If you are using Firefox, just go to [Tools] > [Downloads] to locate this file. 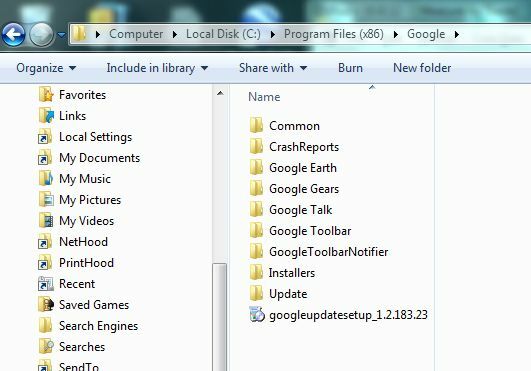 Once you have located the folder, double-click the [google-setup.exe] file inside the folder. The installation dialogue should pop up. Click [Run] to start the installation. 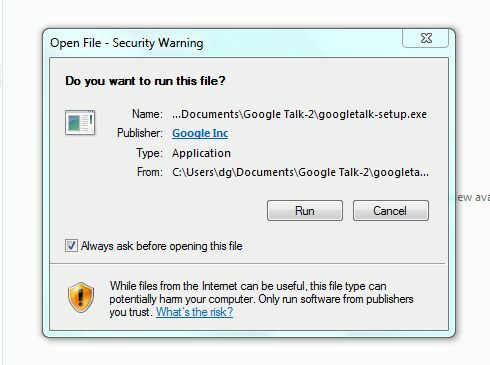 If you have an older version of G-Talk that is not compatible with your computer system, the wizard will ask you to remove it. 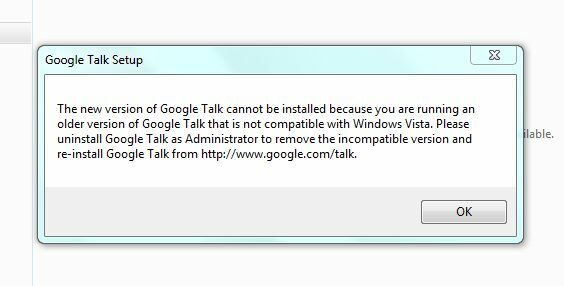 I had an old version of G-Talk on my Windows 7 operating system which was not compatible with the system, so I was prompted to uninstall it first, prior to installing the new version. I browsed to the location of this program on my PC and it seems it came along in the package with Google Earth. 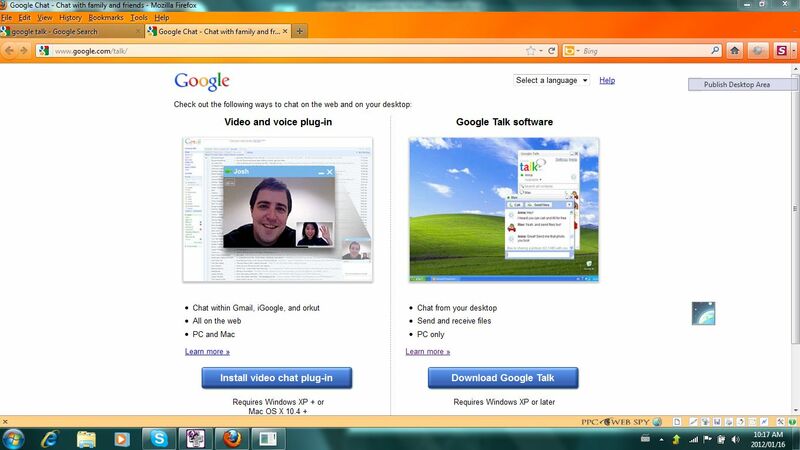 I deleted the Google Talk folder inside the Google Program Folder and re-started the installation. This time when I ran the exe file, it opened the dialogue box. Click [I agree] on the dialogue box to proceed with the installation. Of course, you should read the License Agreement Terms of the software before you agree. After clicking [I Agree], the software should begin installing. The software installs in seconds because it’s a small file. 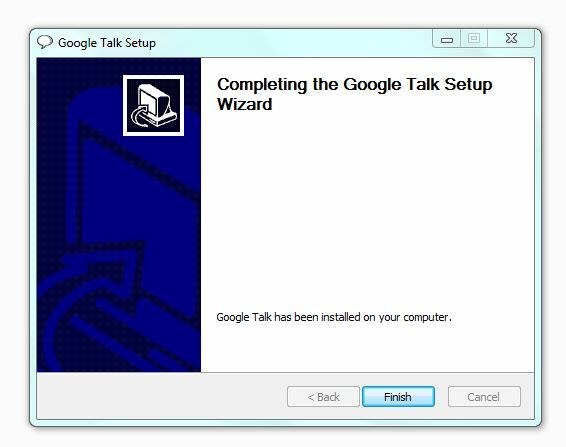 When the installation is complete, the wizard will tell you that “Google Talk has been installed on your computer”. Click [Finish] on the dialogue box and your installation is complete. Click the Windows StartUp button to check the software on your programs list. You can pin the program start-up icon to your task bar or Start Menu. 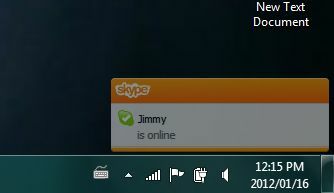 To start the chat program, click the GTalk icon on your desktop or task bar. A login form should pop up on your screen. You should enter your Gmail username and password and click [Sign In] to log into chat. Click [Remember Password] to allow the computer to remember your login details, so that you can be logged in automatically next time. Once you are signed into GChat, you should see your contacts. A green dot indicates contacts that are currently online. You can add more contacts on your chat list by clicking the [+Add] button at the bottom left of the login page. Type in the Gmail addresses of the contacts that you want to add to your chat list, in the provided box. The fastest way to add contacts to your chat list is to click the [Choose from my contacts] button at the bottom left of the form. Tick the names that you want to add and click [OK].After you select your contacts, Gmail will send an invitation to these contacts. The contacts can accept or decline your invitation by choosing Yes or No respectively. The settings button for Google Chat is found at the top right of the login page. Here you can block people, choose custom settings for notifications, appearance as well as set up proxies. 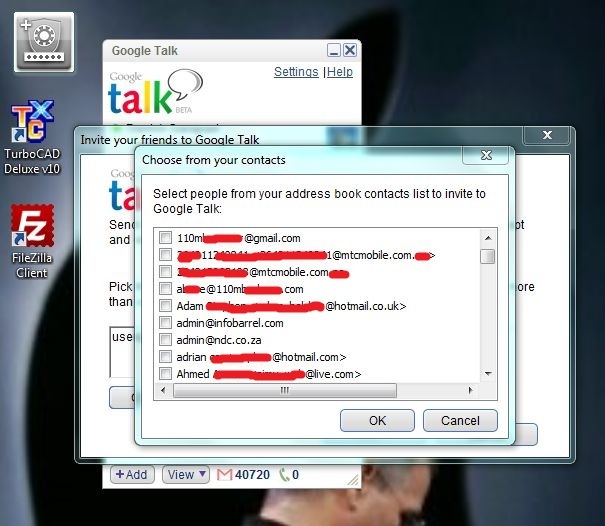 You are also able to save your GTalk conversations in your Gmail account. 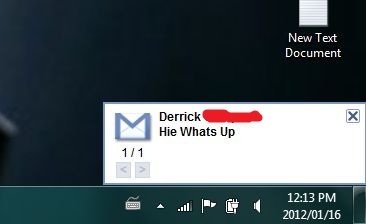 Google Talk comes with its own email notifier.This is an app that gives you a notification on your computer when you receive email. The notification shows up as a small box that pops out on the bottom right hand corner of your computer. STEP 7: Wait for the download to complete.Only a few seconds. STEP 12: Add more contacts to chat with.Type in their email addresses and send invites. STEP 14: Google Messenger email notifier alerts you of incoming messages.